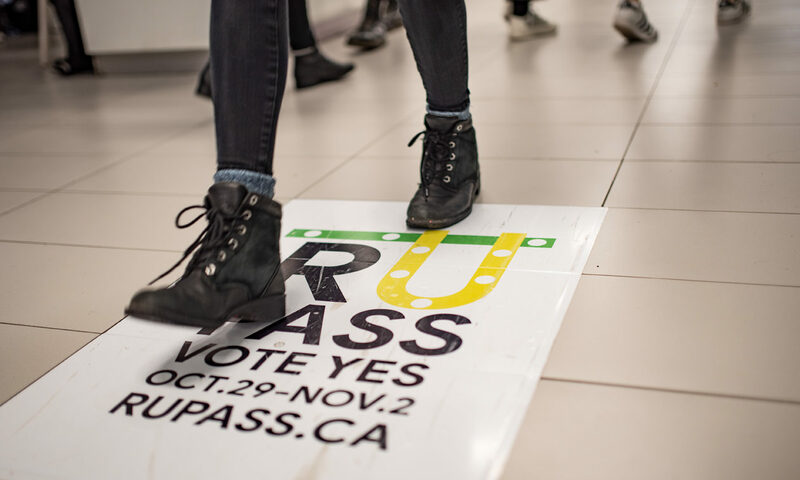 The campaign advocating for students to vote Yes in last week’s RU-Pass referendum was partly based on misleading information, an undercover Ryersonian investigation has found. This puts the campaign in direct violation of Ryerson’s referendum policy, which prohibits distributing inaccurate information. The Ryersonian also observed campaigners for the Yes side offer pizza and waffles to students only after students provided confirmation they had voted, another violation of school policy. In the days leading up to the vote, posts on social media websites alleged that the Ryerson Students’ Union (RSU), which was campaigning for the Yes side in the RU-Pass referendum, was misinforming students. The Yes side won last Thursday, with just over a quarter of the student population voting in favour of introducing the pass. The controversial pass is set to roll out in September 2019 and cost students $70 per month, or $564 per school year. Ram Ganesh, RSU president, told the Ryersonian that there was “extensive training” for RU-Pass representatives. There were seven training sessions for volunteers, board members, executives and part-time staff at the RSU. “We did everything we did to train our volunteers,” Ganesh says. But that information is wrong, said Fannie Sunshine, media relations spokesperson at Metrolinx. “There was a meeting last year where university students, including students from Ryerson, met with Metrolinx staff to propose a UPass program. We explained that GO pass products are not feasible at this time,” Sunshine wrote in an email. Ganesh refused to comment on whether or not the RSU checked the accuracy of the information, such as any future deals with Metrolinx, that they were given from the previous RSU administration. “This was three years of work, with multiple different teams negotiating with people at GO. You’re one person (at the Ryersonian) trying to call GO…there could have been a communication gap on your end too,” Ganesh says. McMaster University does not have a student GO pass, said John McGowan, general manager of McMaster Students Union (MSU). McGowan, who helped negotiate the local transit pass for his university, explained that the only deal they have with Metrolinx is that their local pass comes on a Presto card. Any travel on GO Transit requires the student to load funds – discounted at the same rate any full-time post-secondary student in Ontario would pay – onto their card. Metrolinx confirmed this to the Ryersonian. Ganesh says that their research indicated that “a school in Hamilton” had a deal with GO. When pressed on how they came to believe that it was McMaster, he said he would have to get back to the Ryersonian. “All that information was transferred to us,” he said. It’s unclear what the rules on campaign posters were for this referendum. According to the Board of Governors’ own referendum procedures, all materials must be submitted to the board secretariat before distribution. 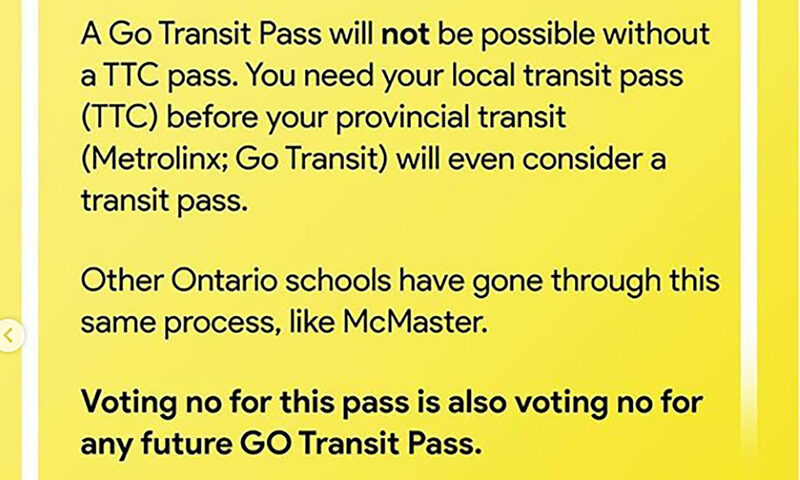 However, the RU-Pass FAQ states that “campaigns are not required to obtain official approval of their campaign materials.” The Yes campaign’s posters included errors like having the wrong voting days and that McMaster has a GO Transit pass. During referendums, the board secretariat is the point of contact for employees, faculty and students, while the returning officer is responsible for campaign conduct during the referendum. At each encounter at RU-Pass campaign tables, Ryersonian journalists were given contradicting statements. In one incident, when pressed on the specifics of the opt-out clause, a Yes campaign representative told our journalist that, “if worst comes to worst you can always sell (the pass), too.” Ganesh says that this would not be possible or legal, as the transit pass would be non-transferable. Another spokesperson told our journalist that there were grants available to students, which would make the pass “basically free.” That’s an apparent reference to the Ryerson Commuter Bursary, which might be available in Winter 2019. But none of the representatives the Ryersonian spoke to could say what the requirements for obtaining the grant would be. A third RSU representative said the RSU would “guarantee” that, failing any future negotiations with TTC, there would be a system in place to refund students for the pass. While it looked to some as though there wasn’t a No campaign, the Ryersonian has learned that there was. Goldie Acai, a graduate nursing student, was the registered spokesperson but she says she didn’t know she was supposed to run an actual campaign. Acai, along with two friends, submitted their application to be the No campaign to the school the day before the deadline, on Oct. 11. She received a message from the board secretariat stating that she was the spokesperson for the No campaign on Oct. 24, just five days before voting began. The campaign group registration form does direct applicants to a document that outlines referendum procedures campaigners are expected to follow. At least one group of concerned students is challenging the results. Diana Schwendener, a PhD candidate in the molecular science program – along with 14 graduate students and six undergrads – has already started the challenge process with the school’s authorities and hopes to have the referendum overturned. Schwendener, who is in her ninth year at Ryerson, originally thought the idea of a transit pass was good, but became wary once the campaign unfolded. The group has also started an online petition in the hopes of showing the school that there are students outside their group who are unhappy with the campaign. When she started hearing RU-Pass representatives tell students in the hallways that they could opt out of the pass, Schwendener said she lost faith in the legitimacy of the campaign. “I think they’ve kind of damaged their profile – I don’t trust them now as a student union to have my best interest at heart. If they’re going to mislead students to get votes, what aren’t they telling me?” she said. As someone who relies on subsidized services at the school, like the Good Food Centre, Schwendener understands how hard it can be to survive as a cash-strapped student. But she feels like her cohort was excluded from the RU-Pass considerations – graduate and post-graduate students go to school all year, making their transit fees higher. 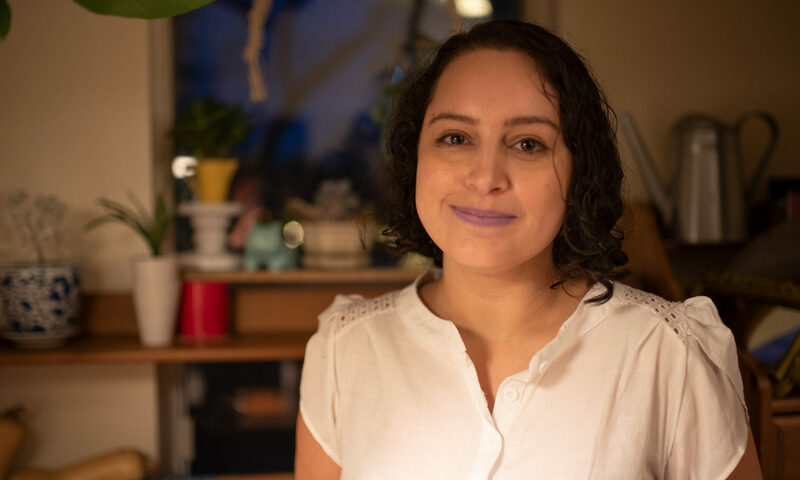 When she decided to do her third degree at Ryerson, she also decided to move downtown and pay extra rent to save on transit costs. Now, she’ll have to pay for both. Schwendener would have no problem accepting the transit pass if it’s what students want, she said, but only after a fair and well-informed vote has taken place. In her eyes, that has yet to happen. An online survey, titled the RSU Misconduct Allegation Form, has been circulating in the wake of the referendum. Lauren Sciacchitano, a second-year medical physics student, started it after reading the numerous accusations levied against the RSU campaign. Sciacchitano lives towards the end of Line 1, at Yonge and Sheppard with her husband. She is one of the many students who would stand to benefit from the RU-Pass. She voted “Yes” because, as a mature student, her wallet is stretched thin. “University students like to joke a lot about not having money, eating really cheap meals and doing various things to cut corners on costs. [But], I wonder how many students don’t go to class because ‘Well I only have one class today and that’s $6 I could save if I didn’t go,’” she said. Sciacchitano sees cheaper transit as a way to help students get through university successfully. But, some things – like fair and informed elections that impact thousands of students’ lives – are bigger than budgets or bills. Sciacchitano’s plan is to take whatever she gets from her survey to the RSU or a third-party auditor for review. If you experienced anything during the RU-Pass referendum that you would like to share with the Ryersonian, please feel free to email or call us at: sonian@ryerson.ca and 416-979-7229. Nothing will be published without your consent. Thanks for doing this Declan, it’s greatly appreciated. Thanks for being the voice that the students here need.